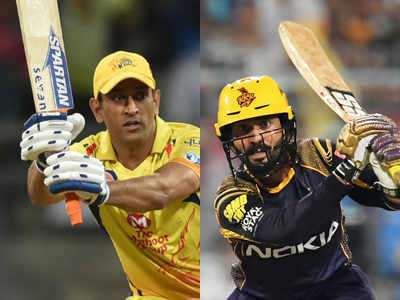 Toppers Chennai Super Kings will look to complete the double against Kolkata Knight Riders, just like Delhi Capitals did, when the teams clash in Sunday’s IPL match in Kolkata. The recent defeats exposed KKR's overdependence on Andre Russell, who is in ominous form, and opponents’ ability to figure out ways to strangulate the Windies power-hitter and restrict the team to below-par totals. To make matters worse, the Jamaican is a doubtful starter for Sunday’s match after aggravating the wrist injury he sustained in Chennai. He never looked at ease during his 21-ball 45 against Delhi. He also could not finish his quota of four overs while bowling and limped off the ground. He was not around during the post-match presentation ceremony too. "He has a bit of an issue. He braved that and still went on to play this game. He is always a special cricketer. We will take a call day after," skipper Dinesh Karthik said about the availability of Russell, who was the man-of-the-match in three of their four wins. Russell has been exceptional for KKR this season, with six successive 40-plus scores, and it will be a massive blow for the hosts if he is forced to sit out at the back end of the tournament. Thankfully for KKR, talented youngster Shubman Gill looked in sublime form and returned a 65 off 39 balls after being promoted to open against Delhi Capitals. KKR certainly need their batting to click as a whole. Skipper Dinesh Karthik, their leading run-getter last season, is struggling this time, having scored just 93 runs, at a woeful average of 15.33. With the Eden surface not helping spinners much, their spin-oriented attack too has struggled to pick wickets while the pace attack of Prasidh Krishna and Lockie Ferguson looked ordinary. Although Dhoni escaped with just a 50 per cent fine on his match fee for the unprecedented confrontation with the umpires, former cricketers came down heavily on India's two-time World Cup winning captain for his act, saying he set a wrong precedent.